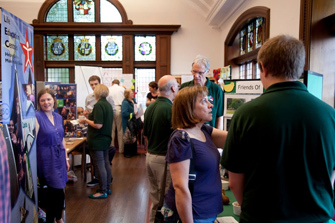 On Saturday 19th July 2014, Altrincham Town Hall was full to the brim as hundreds of local residents lined up to have their say on Voluntary Sector grant funding in the area. 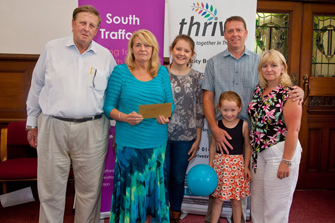 Over 250 local people turned out for the public voting event, which was hosted by the South Locality Partnership and Thrive Trafford, to distribute £30,000 of funding to local voluntary and community organisations. 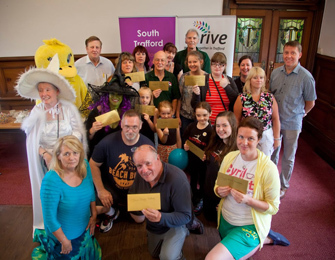 The grant funding was made available through Trafford Council’s Voluntary Sector Grants scheme, which supports the development of projects to help improve local communities. The South Locality projects focused on local priorities, which included; ‘Reducing Older People’s Isolation’, ‘Employment, Education and Skills’, ‘Intergenerational Activities’, and ‘Healthy Living’. 16 projects were shortlisted to go through to the public voting stage and each shortlisted project hosted a stall at the event, showcasing their project ideas and providing information about their organisations. The Altrincham stalls highlighted the creativity of the area, with stalls featuring witches, chickens and fantastic arts displays! Residents then voted for their favourite projects. Representatives from the South Locality Partnership announced the nine successful projects on the day; which included: Cyril Flint Volunteers, Tree Things Trafford, Sale and Altrincham Mencap, G-FORCE, DanceWorks, Altrincham Community Team Ltd, Friends of Woodstock Park, Art with a Heart and Friends of John Leigh Park. Saturday was the third public voting event in Trafford this summer, and marked the highest attendance so far, having generated considerable interest through local social media. Take a look at our twitter feed @thrivetrafford to view more of the groups tweets about the event. Our vision is a future in which healthy relationships are actively promoted as the heart of a thriving society. We do this by delivering counselling to children, young people, individuals, couples and families and by running short courses that aim to equip people with a wide variety of skills and knowledge. The project will target those local residents who are unemployed, on low incomes or facing financial difficulty which means that they would not be able to contribute at all to the cost of a counselling service. Relate GMS will offer up to 6 free sessions of counselling for children, young people, individuals, couples or families who live in the South Trafford locality (the wards of Altrincham, Bowdon, Broadheath, Hale Barns, Hale Central, Timperley and Village). Our project will help achieve the healthy living priority, particularly around mental health and emotional wellbeing. It will give local residents a safe, confidential place to address and resolve specific problems, assist them in making decisions and helping them cope with stress. Counselling enables people to develop personal insight so they can work through their feelings and improve their relationship with others. Our aim is to reduce social isolation within the community. We have a waiting list of isolated older adults waiting to access our service. We do this by pairing up isolated individuals with a befriender who will visit them for at least one hour a week. We will recruit 25 volunteers throughout the South area to be matched with isolated older adults who have requested a befriender. A percentage of these volunteers will be under 25- therefore promoting intergenerational activities. We will provide training for these volunteers- including safeguarding training, introduction to befriending and health and safety training. We will produce a film that will involve volunteers and service users and be used in the promotion of the charity, during volunteer training and to give information to service users and referrer’s. This project would initially run for 12 months but we would then look for funding from other sources to enable us to continue the project in the future. blueSCI is a not for profit social enterprise which supports adults in Trafford who are experiencing emotional or psychological distress. blueSCI aims to support individuals in a person centred way to achieve better life recovery by reaching their full potential. We work with individuals to ascertain their goals and aspirations. We would like to provide gentle sports activities that over 55’s can get involved in to stay healthy and happy in their older years. We would like to provide a range of activities, that will be open for local residents to join, that will be delivered from Broomwood Community Wellbeing Centre. We have been working in partnership with Trafford Leisure Trust to recruit and train a volunteer to be able to deliver the ‘Healthy Hips and Hearts’ programme in the centre. We would like to recruit and train a further 2 volunteers to assist in the delivery, and support people accessing the activities. We would like to run a gentle sports session and a Silver Cinema. For the gentle sports session we would like to run indoor bowls and curling sessions with other fun, low impact games, and table top activities that people can take part in. Finally we would like to deliver a Silver Cinema where over 55’s from the local community will be invited to come and take part in the viewing and discussing films that they would like to see. Our aim is to help children lead healthy lives by increasing children’s ability to make healthy choices, particularly those relating to the reduction in substance misuse, increasing schools’ effectiveness to support children to make healthy choices and increasing parents’ ability to support their children to make healthy choices. Coram Life Education (CLE) contributes to the Personal Social and Health Education curriculum. CLE educators visit children with a specially designed mobile classroom, and facilitate sessions working towards key learning outcomes, that are individual to each age group. Educators use a life-skills approach, designed to increase children’s knowledge, develop skills and confidence, explore attitudes and clarify values. If our application is successful we will be able to offer South Trafford schools 12 days at no cost, thus reaching over 1200 children, 36-48 teachers depending on the number of classes per day. This is based on the number of children in each school and the school’s existing timetable and commitments. We also invite parents / carers into the mobile classroom for a short awareness raising session. We are a volunteer user led community arts group based in Trafford and made up of people who have experienced mental health distress. The management committee consists of three volunteers. We manage art and craft activities at four sites in Trafford. We run a number of weekly workshops for people in the local area who are experiencing mental or emotional distress. The workshops are all art or craft based and encourage people to build their social capital. We actively welcome people from different religions and beliefs and local minority communities. The premises we use are all accessible. Our project is one which will reduce older people’s isolation. We will work with the Friday Club, an over 50s group which meets at the Broomwood Community and Well-being Centre. We will organise visits to the local countryside using wheelchair accessible transport. We will encourage people to take photographs, do sketches and collect found materials or record their thoughts verbally. We will work with volunteers from Seed Studios at the Broomwood Centre and they will make recordings of the visits. We will then hold workshops at the Broomwood Centre where people will use the materials they collected to produce mixed media pieces. They will be supported by Seed Studios volunteers to use sound editing software to edit the sound recordings into soundscapes. These will be made available as downloads and Seed volunteers will work with people to make sure they are available to those who took part. The art work will be exhibited at the Broomwood Centre together with the soundscapes, which will be available to listen to at listening posts or as a download for MP3 players. We are a user led community group who have managed music studios in Trafford for 7 years. We are an arts and wellbeing organisation with roots in mental health recovery, working holistically tackling health inequalities. We do not employ any paid staff. The management committee is made up of 4 volunteers. Using music as a tool, volunteers run weekly accessible workshops for local people encouraging involvement from minority groups, cross gender participation and inclusion to all. We empower people to achieve creative goals, improve wellbeing, confidence, social capital and gain a better chance in life. Seed will work with a group of 15 volunteers who are looking to increase their employment and education skills after becoming unemployed or never managing to achieve employment after leaving education. These volunteers will work with 40 individuals over the age of 50 to explore their history. Our project will work in partnership with the ‘Friday Club’, an over 50’s group based at the Broomwood centre. We will encourage a discussion exploring what things have changed over the last 80 to 100 years and what has improved in people’s lives. The 15 volunteers will also be trained in photography and Photoshop. They will take a variety of portrait pictures of themselves and the individuals from the Friday club at their homes, the places they like to visit or places relevant to their stories. These photographs will be displayed on large prints in an exhibition in the Broomwood Centre with listening posts next to each picture so you can look at the portraits and listen to the conversation that have been captured throughout the project. DWA is a small, constituted, community dance group based in Broadheath, Altrincham. Currently, DWA volunteers deliver dance/fitness related activities for a total of 18 hours per week with fees capped to off-set room rent/insurance etc. Our pupils live mainly in Broadheath with the remainder living in Sale/Timperley/Hale. We hope that as our plans come to fruition, we can open up more class/activity time of interest to our community, especially as we are formally committed to moving into the new community centre to be built towards the end of 2014. We wish to establish 2 student teachers as community Cheer-leading coaches. They are Sport Leaders within their respective schools and are long-standing pupils of DWA. They currently volunteer as dance classroom assistant / student teachers for 9 hours per week and both also volunteer at Broadheath Community Association events. We feel that we’ve fostered a volunteering/community work ethos which could be capitalised upon with some initial financial investment and that this could inspire other pupils to follow their footsteps to deliver this or a related activity within their own community. In the long term, this project should produce a self-sustaining, rolling programme for teenagers who aspire to become Cheer dance/fitness coaches for their community – wishing to give back what they have experienced from DWA. In a wider sense, we simply hope that we foster an attitude where volunteering is viewed positively. Altrincham Community Team is a not for profit company which is a collaboration of community groups, community-minded businesses and residents working in partnership to contribute to the advancement of Altrincham. Membership already includes more the 50 community groups, individuals and businesses in Altrincham prepared to give their time, money and other resources and get involved in initiatives to help to make Altrincham a better place. The group is looking to repeat Spookywoo Spectacular (first staged in 2012) at Halloween this year and then run a Spring event in 2015 with more events to follow in future years. By organising events aimed primarily a children we ensure full family involvement with parents and grandparents joining in enthusiastically with what is going on. The events will be on a larger scale than the original Spookywoo and will involve more businesses, community groups and volunteers. We aim to provide more free / cost price activities for families and children of all ages. Activities planned include art, writing, making things, colouring, guessing games and learning, e.g. word search and simple crosswords, fancy dress, hair and nail art, activity based games such as traditional children’s party games, dancing and a town treasure hunt. Short films, entertainers, a DJ and music will be included and local entertainment groups such as dance and music schools will be encouraged to showcase their activities. The Friends of Woodstock Park aim to encourage the community to spend more time in the park by improving the communal green space in the park. This includes making the park a more appealing place to visit and providing seating for residents when they attend fun days, health walks, youth activities etc at the park. When the community see the changes being made to the park by the benches/seating it will highlight the potential of the community space we have and make people think about future improvements they would like. Birds of Paradise Arts was established by Trafford resident Jo Egerton in 2010 and has recently submitted an application to register as a community Interest Company. Birds of Paradise Arts provides a range of arts activities and projects for children, young people and families to support mental health and wellbeing. Activities are tailor made to suit the needs of individuals or groups and aim to provide a fun, educational and health focused approach delivered in a supportive way. By offering courses, volunteer opportunities and work experience we have developed a transitional approach to developing and supporting individuals. Birds of Paradise have developed a community based arts programme, which supports the whole family. The Cherished programme provides a pathway to learn new skills, improve the mental health and well-being of children, young people and families along-side offering opportunities to develop individual skills through volunteering and/or work placements. Birds of Paradise would like to pilot the Big Family Art Club & Arts Award Discover element of the Cherished Programme within South Trafford. The pilot will offer intergenerational fun through arts, play and games based activities . The Big Family Art Club addresses the five ways to wellbeing contributing to a healthy life style. Art with a Heart is a constituted not for profit organisation. Based on the High Street we deliver Arts and Heritage for the benefit of the community. Our guiding principles are Collaboration, Complementing and Creativity based on core values of Trust, Respect, Inclusive, Passionate, Originality and Determined. If successful, Art with a Heart will deliver a series of events, based on intergenerational activities between the socially isolated older generation and students from local senior schools in the Trafford locality. These events will be free of charge to both the older generation and students. The events will take place on a monthly basis and participants will be identified by collaborating with the local schools in Trafford and the various organisations that deliver care in the community across Trafford, including HomeInstead, Cyril Flint Volunteers and Absolute Care. Working with these organisations we will offer the opportunity to approximately 30 different residents in the area and 6 students from each of the schools in the area each month. The event is a Vintage Tea based on the theme ‘Mothers Knows Best’. The voice recordings of these stories in a relaxed and friendly environment during the Vintage Tea will encourage the interaction between the students and the older generation. The students with supervision from an experienced Art with a Heart volunteer, will create the interview script, perform the interview and edit the interviews for submission to the North West Sound Archives. These sound bites will also be available to be listened to by visitors to Art with a Heart. The students will work for 5 days for each event to produce the sound bites. The group exists to act as a voice for the local community and work in partnership with Trafford Council to maintain & improve the amenities at John Leigh Park, Oldfield Road, Altrincham. The group also encourages the community of all ages to use the park & facilities through holding events and promoting active involvement in the Friends group. The project we are applying for funding for is to save the aviary from closure. The aviary is a popular attraction and is a unique feature among local parks. The importance of the aviary and its potential closure has created a surge of new interest in the Friends group and we hope to reach an agreement with Trafford Council that we have a viable business case for the continued operation of the aviary by the Friends group. The aviary requires a lot of manpower to run, with daily feeding, cleaning and inspection taking 2 to 3 hours. The group has already gathered enough volunteers to run a sustainable rota to meet the daily manpower requirement. Fundraising efforts are also underway to provide the group with an income to meet the annual costs. Award of a grant would put the group on a solid footing for many years and allow us to meet the immediate time pressure of the aviary closure due in August 2014. We aim to provide an opportunity for over 50s to meet at a weekly saytime group to socialise and share an interest in literature. Members may choose to be entertained, other may wish to perform or help to plan events where young children from Spotlight Drama Club will join together for special performances. The main aim of the group is to provide a fun and friendly atmosphere for people to reconnect with a passion they had when they were younger, or explore new hobby or to enjoy sharing skills and talents with children. We are planning to set up a project in September 2014 at Bowdon Parish Centre called Spotlight Seniors. It will offer weekly drop in sessions where members can enjoy sharing a love of literature without pressure to be in a performance or show. Speaking aloud telling stories and poems is a great way to exercise your voice and can leave people with a feeling of well-being. Spotlight seniors would be planned and and run professionally with administration support behind the scenes and a fully qualified speech and drama practitioner running the group. The project will run weekly for 6 months breaking only for Christmas period. The grant will provide materials, resources, professional support and advertising. We are a volunteer led community woodwork group based in Broomwood, Timperley. We started up because we had experienced chronic ill health and/or mental health issues. As men, we found there was very little support available to deal with these issues either from our colleagues or employers. We meet once a week at the Community Well-being Centre in Broomwood, working on woodwork projects and supporting each other to manage our mental or emotional distress. We actively welcome people from different religions and beliefs and local minority communities. We actively encourage cross gender participation. The premises we use are fully accessible. We meet once a week to work on woodwork projects at the Community Centre in Broomwood. There is a piece of land there and local people tell us they would like to see it turned into an eco garden for everyone to enjoy. We will develop this garden, building accessible raised beds, furniture, storage etc. Local people will be able to help grow fruit and vegetables or simply enjoy the garden. We will clear the land we have identified and build raised beds, benches, sheds etc. We will plant fruit, vegetables and flowers. We will encourage people from the local area to get involved in the woodwork and gardening parts of the project, particularly the long-term unemployed. G-Force mission is to provide a broad range of bespoke services to individuals and the community of Broomwood (and the wider Altrincham area), designed to empower those engaged into growing and developing as individuals and as a community. These services are designed to broaden life skills, add confidence, ambition and cohesion. These services offer real development opportunities that add value to people’s lives, challenge their attitudes to others and their perception of themselves, encouraging capacity building on a personal, social, educational, experiential and community level. This project will use art as an engagement method and target all four priority groups. It will engage them in producing high quality pieces of art that will be displayed as an outdoor Art Trail around Altrincham. The theme of the Art trail will be ‘Altrincham and its connection to the First World War’. The project will be led by a Sessional Artist who has many years of artistic experience in all artistic areas and who has excellent skills sharing abilities. The pieces of art will be installed at locations around Altrincham and celebrate local places, people or points of interest with a connection to the Great War. The end result will be an Art Trail around Altrincham that connects people to our shared history and commemorates the part Altrincham played in World War One. It will be made up of 8 pieces of outdoor art on public display. Sale & Altrincham Mencap is a charity whose aim is to ensure that local adults with learning difficulties and their families are supported and valued. 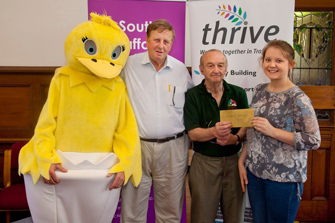 Food 4 Us was established in response to a Trafford Council Partnership annual event held in 2013. After the event, a project group was established, meeting on a bi-monthly basis, to develop the project further. Sale & Altrincham Mencap has taken on the responsibility of coordinating the project. The main focus of the project is to develop spaces for growing food and to harvest surplus food and distribute it to those in need. This project will run on one half day session per week during term time (40 weeks). We will be working with adults with learning difficulties and our local community.We aim to develop our work with young adults who have recently finished at college along with those who have retired from work. We currently have 15 regular attendees, although we intend for this group to grow. We have already been in contact with current horticultural students with learning difficulties at Trafford College. When they leave in the summer we will introduce them to our group, inviting them to join. We plan to progress our work at Timperley Library, developing an edible garden for our local community.